It's not just those who have worked at Blizzard for 5, 10 or 20 years that get awesome presents. A lot of other people do as well. The statue you see was the company's "2012 Holiday Employee Gift", something only those on Blizzard's payroll were eligible to receive. Sculpted by Blizzard's Brian Fay, the same man behind Sideshow's impressive Diablo statue, it depicts one of Diablo III's treasure goblins. A Statue of Diablo Itself? That&apos;ll Cost Ya. 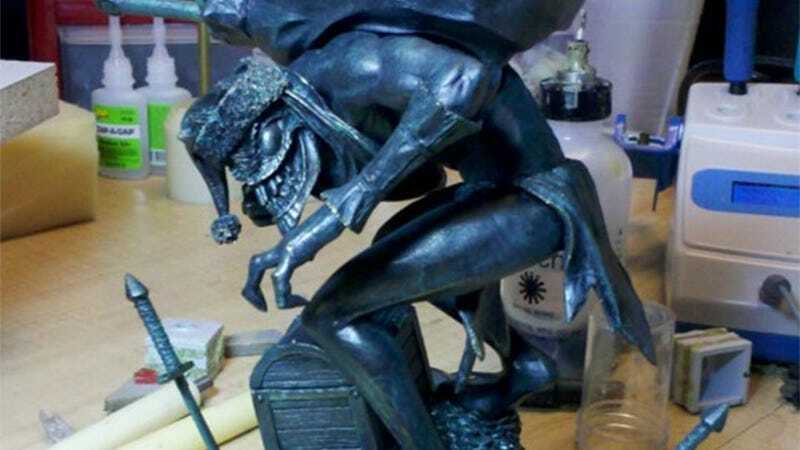 While the statue itself is terrific (this is the original for the mould), it's the base that should get Fay an extra round of applause, because he had to do it the hard way. Made to resemble a mountain of coins, this base sculpt is actually made of over 1300 metal rings that had to be stuck together then, to complete the effect, filled in. Individually. By hand.